The all new and updated version of Karen’s book is now available. It has recently been added as an Alzheimer’s/Dementia Resource Book with the National Institute of Health (NIH). It may be a relatively little book, yet it's big in terms of in-depth information! Ideal for both individuals and professional caregivers, it's available for just $14.95 per book, with first class mail shipping included. 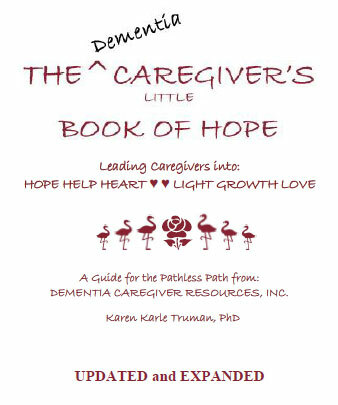 “THE DEMENTIA CAREGIVER’S LITTLE BOOK OF HOPE”, Dr. Karen Truman addresses issues important to all caregivers. In addition, Dr. Truman provides resources and information for guidance and direction on your caregiving journey. Copyright 2009 Dementia Caregiver Resources, Inc.
Why Flamingos on the cover? *NEW* Order the Kindle version! Or, print the form below, then mail or fax it.